Recently some good friends celebrated my birthday by wining and dining us in their lovely home. They bade us farewell with a large vase of two dozen cut stems of Louisiana Irises that were in bloom, along with a birthday card and memories of a lovely evening. Talk about great birthday gifts! It is about a week now since that evening spent with friends, and the irises are still gracing our home with their beauty. This made me think of our experiences growing irises throughout the years in various locations, both in northern climates as well as southern ones. For anyone looking to grow a hardy and perennial flower that spreads fairly rapidly, this just might be what you are seeking! Irises also make for great cut flowers that last for quite some time. 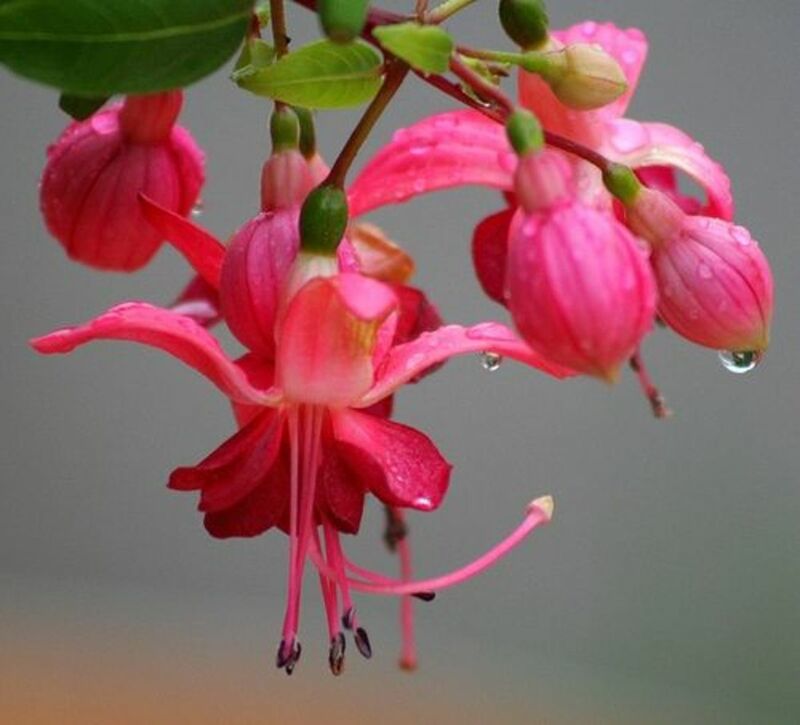 They are reblooming flowers in the sense that the top flowers are followed by other buds on the same stalk that open generally one at a time. 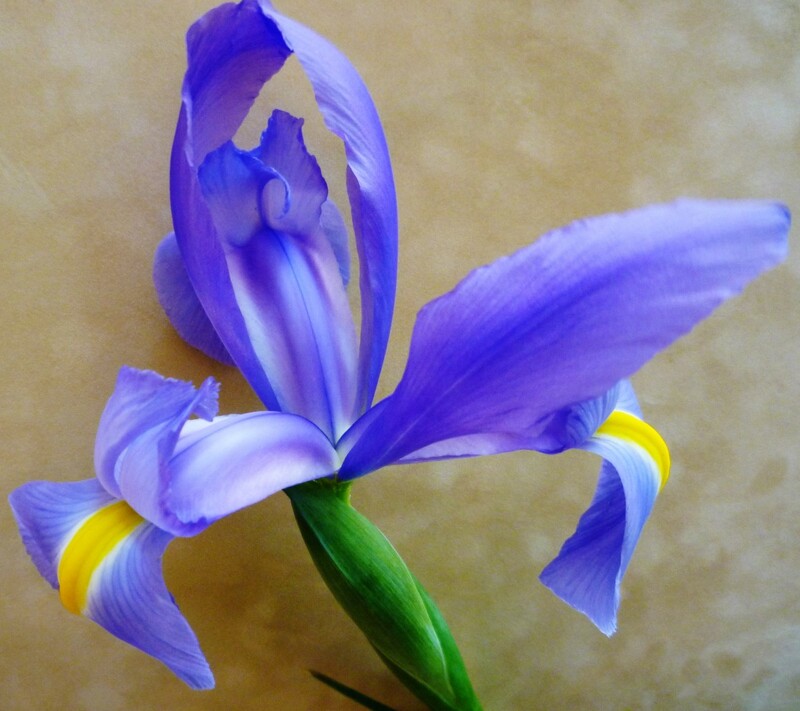 Just snip the spent iris flowers off and watch that stalk bloom again and again until the last bud is opened. Anyone seeking a specific color for their garden landscape will certainly be able to find it within the family of irises. Irises come in an almost limitless number of colors as there are many hundreds of varieties / families of these satisfying flower plants! Rhizomes are fleshy thick roots that grow horizontally just under the ground. When my husband and I were transferred from Houston and lived in Wisconsin Rapids, Wisconsin for four years, my grandmother gave us some tulip bulbs and also some iris rhizomes from her garden. 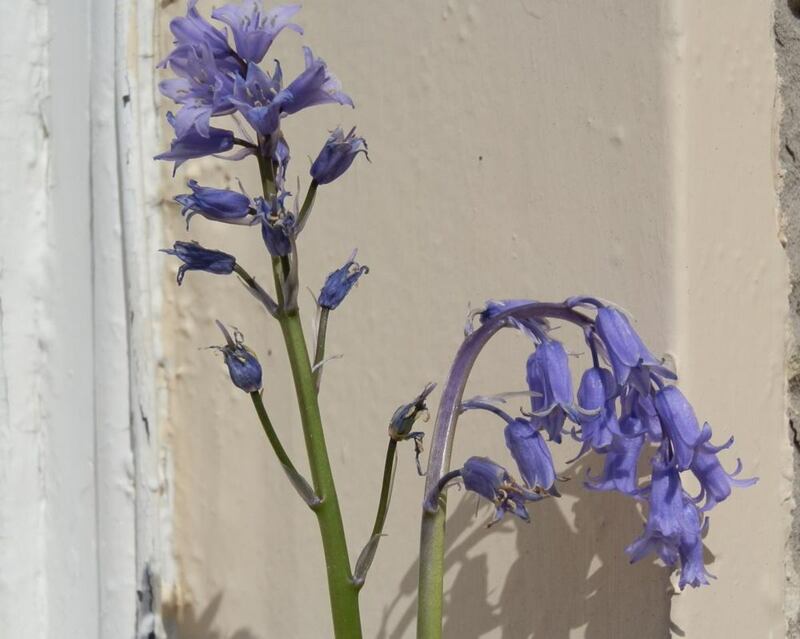 Like many perennial plants as they grow, replicate and spread, eventually they need to be thinned so that the remaining bulbs or rhizomes have room to take in nourishment from the soil and produce large and showy blossoms. Thus we gained some great perennial flowers for our new yard and garden areas while also aiding my grandmother's garden beds in keeping them healthy. Prior to leaving Wisconsin when coming back to Houston we were able to share hundreds of those perennials with our friends and neighbors who have probably done the same by now as it was many years ago when we lived there. We mostly grew the Bearded Iris in Wisconsin which blooms in the Springtime of the year as do the tulips. They have large blossoms with caterpillar-like fuzzy areas on the petals that droop down. You can see an example in the photo below. They come in all kinds of different colors. Full sun or many hours of sun per day and well drained soil with reasonable amounts of water are the requirements for most Iris. There are some however that prefer partial shade. Some Iris plants can grow successfully in marshy areas and actually like their "feet" kept wet. These are the Louisiana Iris of which we are familiar in the Houston area. 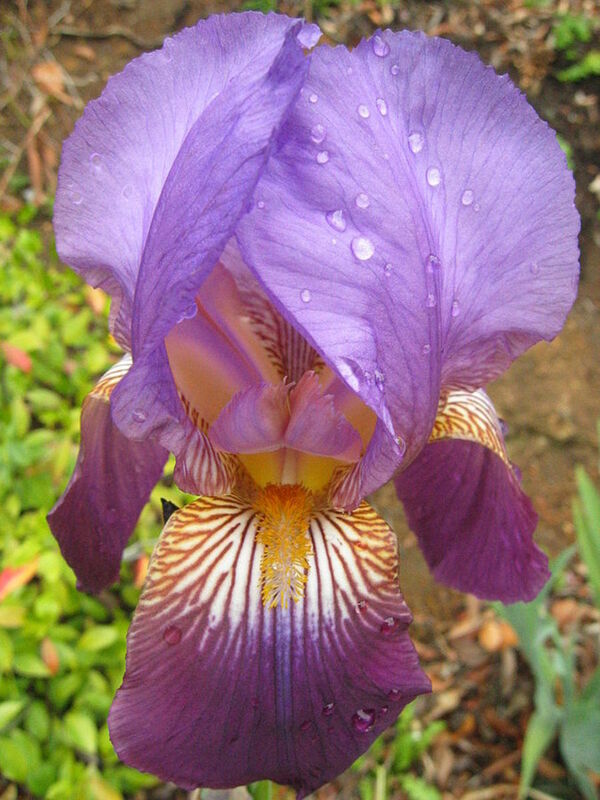 Others that enjoy wet conditions are the Japanese and Siberian Iris. In our part of the country the Louisiana Iris are mostly evergreen in nature whereas the more northern grown varieties die back and put up new growth each Spring. 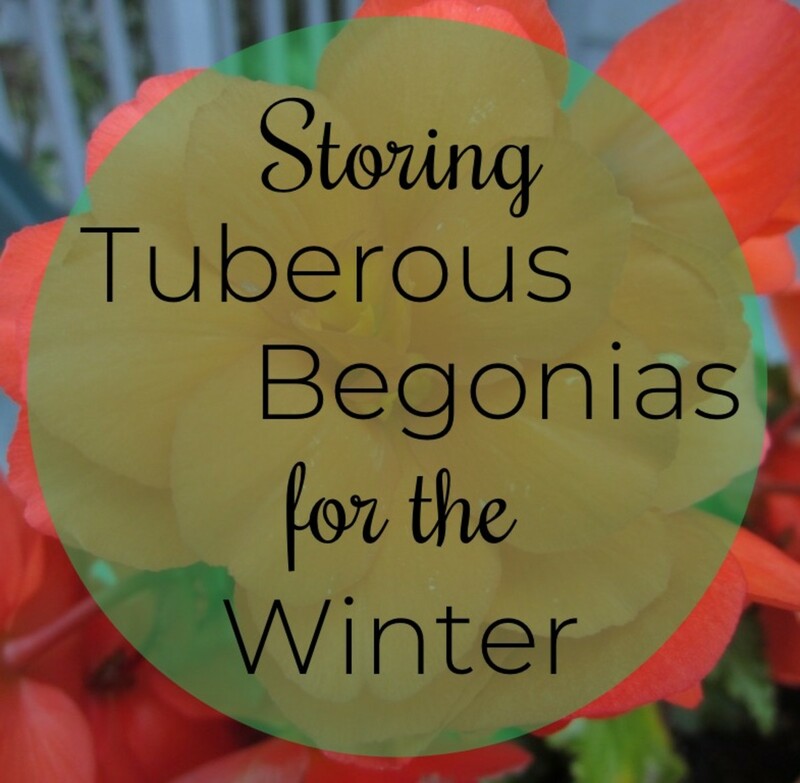 If growing these perennial flowers up north, prior to freezing weather, it is best to cut the leaves back to a height of around 4 to 5 inches above ground. Then top them generously with mulch. Division of these flowering plants should be done every 4 or 5 years. This allows the bulbs or rhizomes more space to absorb soil nutrients. They will reward the gardener with bigger and more prolific blooms. When dividing and replanting the rhizome varieties it is okay to break off pieces of those long tuberous roots and discard them. Just keep several inches of the rhizome nearest the leaves to replant. 3 or 4 inches should be enough of the root to sustain and help nourish the newly moved plant from my personal experience. Prep the soil for the new plants prior to planting by digging a hole at least 10 inches deep and place some compost or fertilizer at the bottom of the hole. Then partially refill the hole. Place the divided rhizomes with a leaf or two attached to it 8 to 12 inches apart or more and do not cover the root with more than an inch of soil. "Since Iris is the Greek goddess for the Messenger of Love, her sacred flower is considered the symbol of communication and messages. Greek men would often plant an iris on the graves of their beloved women as a tribute to the goddess Iris, whose duty it was to take the souls of women to the Elysian fields." Years ago I purchased 5 different colored Louisiana Iris from a Bulb Mart at a Houston church. It did not take long before we were sharing irises with others. They grow easily in our hot and humid climate and actually love our generally moist and acidic soil. Our soil is quite heavy and consists of much clay which holds water. We work hard to amend the soil conditions for most of our plants particularly when first planting them. The thick rhizome roots spread rapidly and my only mistake was in letting the different colored irises get too close together as they spread. The more dominant colors took over and what was originally 5 different colors over time became just 2 or 3. The lavender, blues and purples seemed to predominate. So from my experience, if you are wanting various colors keep them spaced far enough from each other so that their colors do not blend. Also keep in mind that while you cannot see the rhizomes just under the ground, they can grow and spread quickly thereby becoming quite friendly with a neighboring plant. At least that is what I imagine happened to those other colored irises. "The 'Amen!' of Nature is always a flower." The Louisiana Iris is the state wildflower of Louisiana. The Dwarf Lake Iris is the state wildflower for Michigan. Iris is the state cultivated flower for the State of Tennessee. It is the national symbol of the country of France. If you are playing the game Trivial Pursuit this information just may come in handy! These Three American States Claim the Iris for State Flowers. Louisiana Iris is state wildflower. Dwarf Lake Iris is state wildflower. Iris is the state cultivated flower. If you wish to be rewarded by a hearty and perennial plant that has flowers that are re-blooming for quite some time, grow in a variety of climates and make terrific cut flowers, think of growing irises. These pictures and videos should give you some idea of the variety of irises and the brownest of thumbs should have success. One need not be an expert gardener to succeed with these flower plants and soon you will have some to share with family or friends. "To analyze the charms of flowers is like dissecting music; it is one of those things which it is far better to enjoy, than to attempt to fully understand." Not yet, but I may give them a try! When is the best time to dig up, separate and replant Louisana Irises? From my experience, you can dig up iris plants any time of year and replant them. If the Louisiana Iris is truly overgrown when you dig each plant up you will find some very long tuberous roots. Feel free to break some of the root off of each plant and discard it prior to replanting. I have seen some that get to be almost a foot long. Keep several inches of the root nearest the leafy part of the plant and plant that. Other types of iris do not form those long roots. 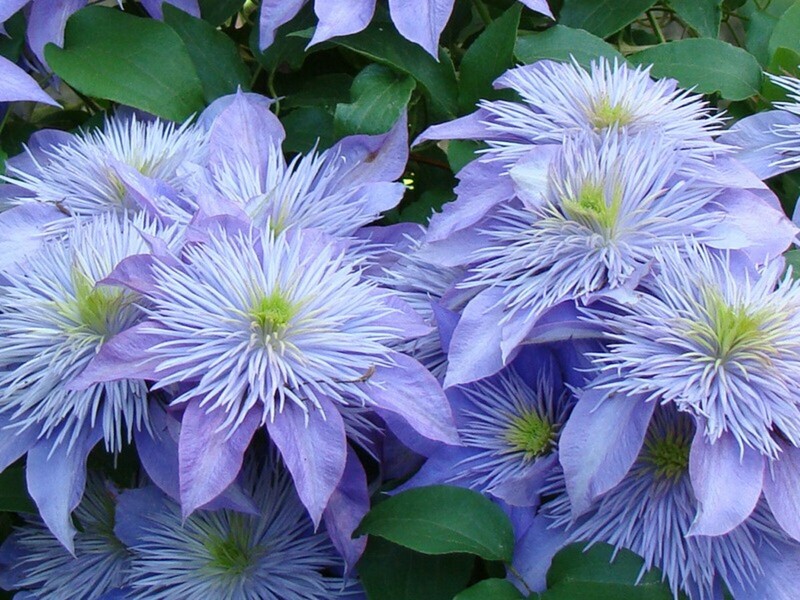 Just dig up clumps of them and separate them prior to planting. Soon you should have many more iris plants if your soil is well prepared and they have the room to spread. My pleasure, Peggy. I loved those photos. Lovely hub on irises Peggy with these photos of beautiful flowers. Great info on them, too. Voted up! I guess it's too late to plant irises this year, but the purple caught my eye as I was looking over your articles deciding which one to look at -- I'm a purple person. Pinned this to my Purple III board. Gorgeous photos! Nice that these flowers bring back memories of your mother. Hope you are having a pleasant weekend also. Thanks for the good thoughts of angels! These are lovely, Peggy. They remind me of my youth. My Momma grew such beautiful iris when I was a young girl and I think that is why I fell in love with them. We also grew many irises when we lived in Wisconsin. They were from my grandmother who thinned out some of her beds. She also gave us tulips. Both grow beautifully up there. Thanks for the vote and pin. Beautiful hub pinning it to my garden hub. I love irises and have them growing in my garden. Voted up. Irises are easy to grow. It is nice once you get them started to be able to share them with friends once you have all that you can possibly use. They certainly do spread but also need thinning out occasionally. I'll bet that yours are gorgeous. Thanks for your comment and the votes. Irises are fabulous, aren't they, so easy to plant and grow. I have loads in my garden, to the extent that every year I have to thin them out and give away the rhizomes. I wish I had a variety of colours but how interesting to note that you lost some of yours. I have dark and pale purple, but you see yellow, white and terracotta ones in hedgerows around here - just fabulous! Voted up and beautiful. Irises are wonderful plants and so easy to divide and share with people...much like day lilies in that respect. So glad that you liked this hub. Thanks for your votes and the share. Gorgeous photos as usual. I love purple so it would be hard to go wrong (for me) with anything that color. Lots of good information about irises here and the video on how to divide and plant them should be helpful to people just getting started in gardening and especially if they've had no experience with irises. Voted up, useful, beautiful, and will share! So glad you liked the photos of these cut Louisiana Irises. They were a terrific birthday gift that have now been memorialized with these photos. Appreciate your comment. So happy to hear that you enjoyed these pictures of the cut Louisiana Irises that were a birthday gift to me this past year. Every time there is a comment it brings me back to the photos and memories of that thoughtful gift...so thank you! Irises are so beautiful. They really make great birthday gifts. Thanks for the beautiful photos. Thanks for coming back and describing these plants found around your pond. Sounds like a gorgeous and enjoyable spot in your landscaping. purple loose-strife is a tall pretty purplish pink, non-native, invasive, flower that competes with cattails. There are catfish, crayfish, and maybe some others in the pond. We have loads of turtles and frogs as well as other wild life. 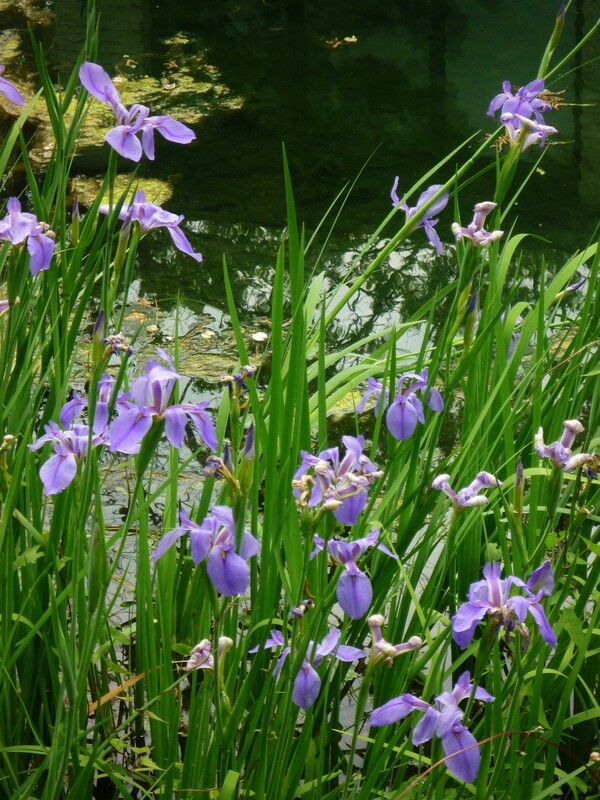 Blue flag is a Michigan native water plant related to the iris. To me it looks like a short blue/purple iris. The Japanese iris that the neighbor gave us is a dark purple. So nice that you were given some Louisiana Irises by your neighbor. What colors? I'm not familiar with the blue flag or purple loose-strife. Will have to look them up to see what they look like. Your pond with the cattails and other plants sounds pretty. Any fish in it? I love irises. My mother used to grow several different colors and varieties. A neighbor gave us some gorgeous Japanese irises. Right now my husband is thinking about finding some blue flag to put around our pond. Hopefully, they will not be run out by the invasive purple loose-strife which is already competing with the cattails. Nice hub! 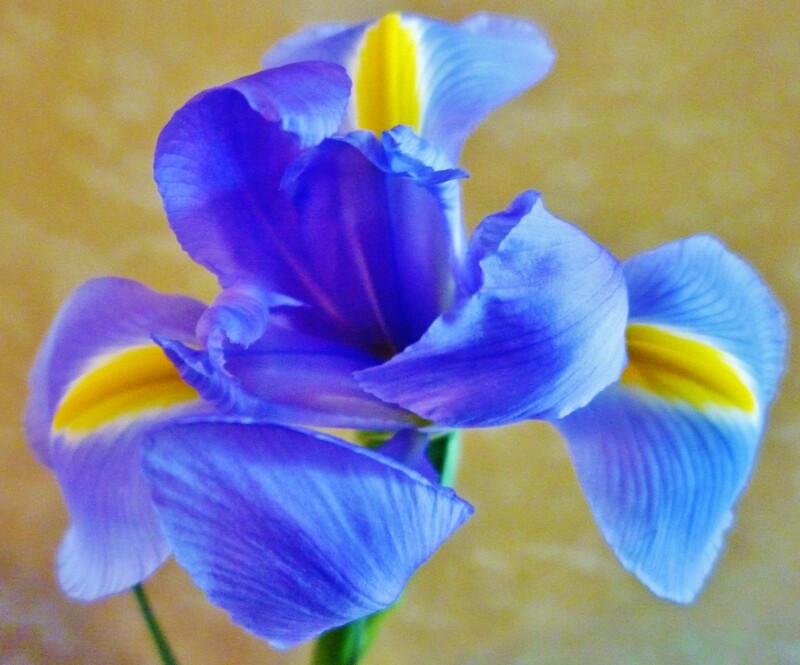 Glad to hear you enjoyed this hub about Louisiana Irises. Thanks for your comment. Beautiful! and thanks for your comment on my Texas Business Card hub -- so inspiring!! So very happy to be able to share these gorgeous irises with you and others with photos. They certainly were a great gift! Thanks for your comment. Your inn would have been beautifully decorated with those irises. Nice of that horticulturist to send them your way. Was he experimenting with creating new and different varieties of the irises? Thanks for your visit and comment. So pleased that you liked this hub about the various types of irises and that you liked the photos of the Louisiana irises that we had gracing our home as a gift. Thanks for your complimentary comment and votes. I love the Iris. A horticulturist with University of Nevada Reno (I think) used to send my "inn" irises from the universities garden occasionally. I do love them. Thank you dear Peggy. This was so beautiful hub. Full of color and I love this flower. You send to us refreshing topic. Well done, Peggy. I'll press all button here. God bless you! Thanks for your complimentary comment and vote. The irises that were a gift would now be just a memory were it not for capturing some of them in pictures. Glad that you liked this hub. I loved this one and the beautiful pictures. I am catching up with reading hubs today and I feel as if I was away for a month and not just a week. It is nice to be back and catch though. I vote this one all the way up . Coming from someone with your photographic talents, that is quite a compliment. Thanks! Hi with every hub the information and beauty of the photographs get better. Rated up Peggy I salute your talent.Best wishes to you. Thanks for the nice comment. Had some fun taking those irises' pictures! They were probably thinking...put me back in water, lady! Ha! 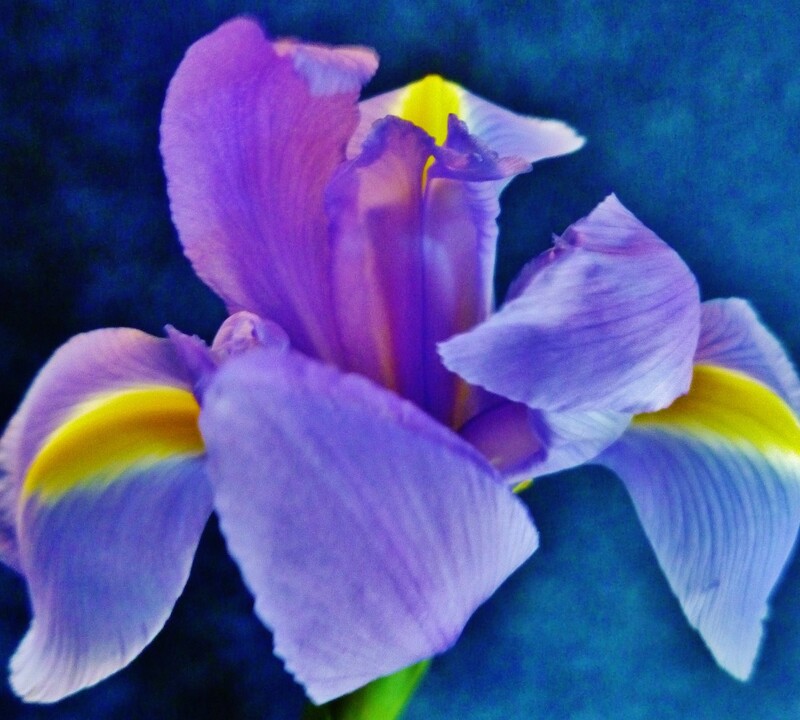 So glad that these iris images could take you to that special garden of which you dream. Hope that it becomes reality for you! Thanks for your comment. I agree with you in that irises grace gardens with unique beauty. Happy to hear that you enjoyed this hub. Thanks for your comment. The Iris a true garden beauty, thanks for this informative and attractive hub. I still have a few of the cut Louisiana Irises left but most are now in the compost bin. They certainly made for a beautiful bouquet! Thanks for your comment. Absolutely beautiful the Louisiana Iris. 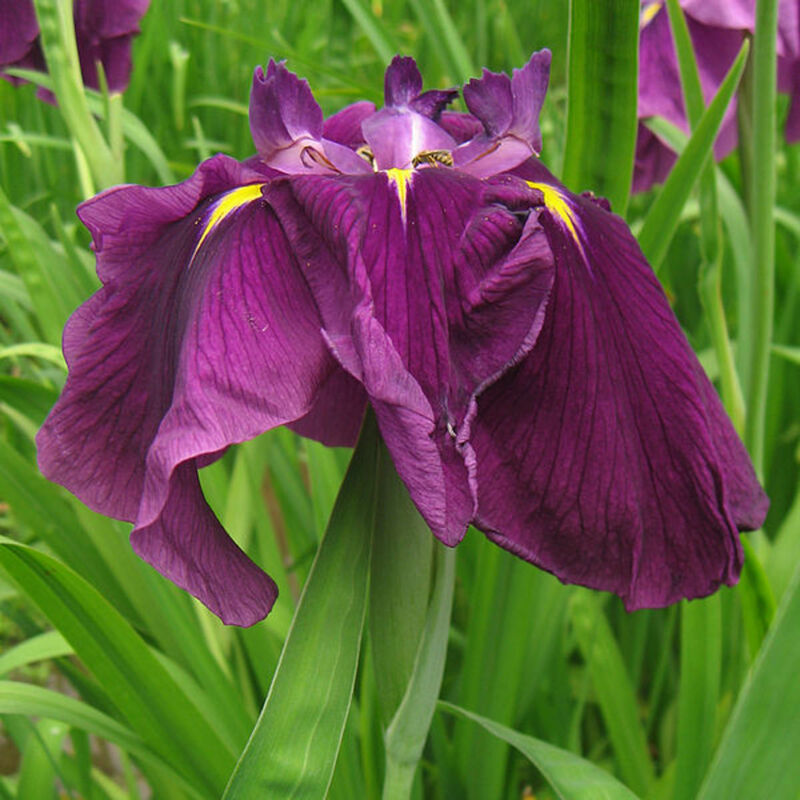 Thanks for the information, photos and videos on Cut Louisiana Irises. A great gift for your birthday. Beautiful and informative hub. Glad that you enjoyed this hub about irises and thanks for the comment. So happy to hear that you enjoyed the pictures and information about irises and about how to grow, divide and care for them. Thanks for taking the time to leave a comment. The pictures are absolutely beautiful. Thank you for a splendid hub to read. What a sweet tradition your husband and his sister have of sending the irises and jonquils to each other on their special days. They must be very close to one another even though distance separates them. Thanks for sharing this with us. Must make you happy also to have so caring a husband! Thanks for your comment and votes. Wow, this is a most informative and beautiful article, Peggy. I will be sharing with both my husband and his dear sister. I love the idea of flowers and a nice meal for your birthday. My hubby and his sister get together whenever possible due to distance. However, he always sends her irises for her April day. She send him jonquils for his March day. It is very tender and meaningful through the years. This was a great reminder for me- thank you. Voted UP & UAB! Have a great week, mar. Irises are a great and hearty type of perennial flower. Glad that you liked this hub and thanks for your comment. Thanks for commenting on the pictures regarding this hub about growing irises and also the cut ones I used for subject matter. Glad that you liked the pictures of the Louisiana irises. Thanks for your comment. Hi Peggy, stunning photos, what a beautiful flower the Iris is, I don't know why I have never grown them! it seems I have been missing out! so I will give them a go, many thanks for a great hub. 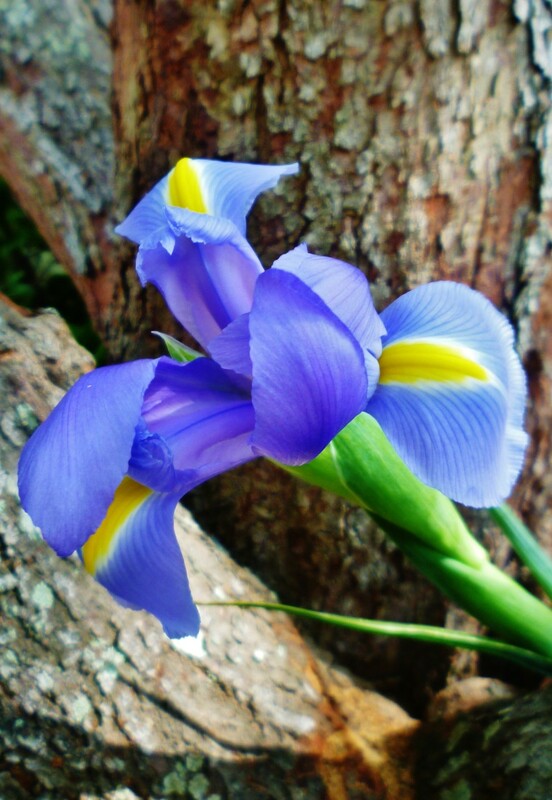 So glad that you enjoyed this hub about irises and thanks for the votes up. 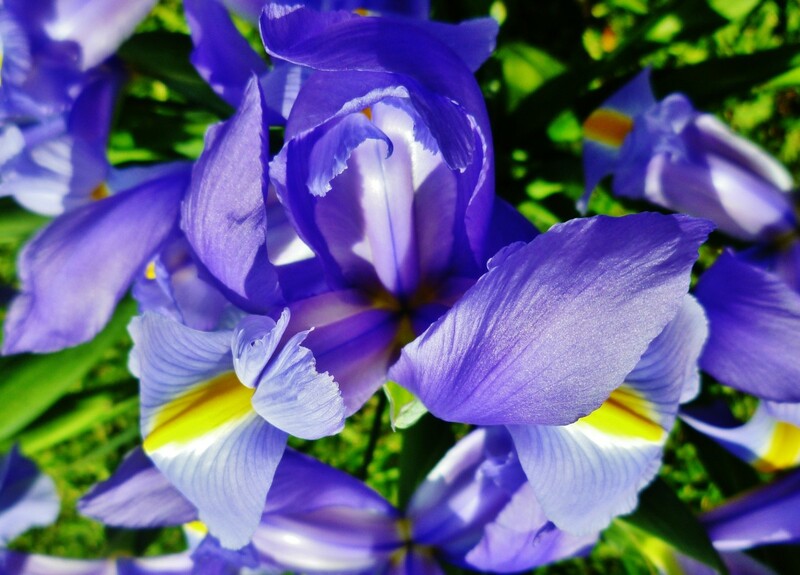 Thanks for the belated birthday wishes and nice to know that you learned something from this hub about irises and that you enjoyed the pictures of the cut Louisiana irises. Had fun with the various poses using them. Thanks for the votes and comment. That is the nice thing about iris. They do spread and increase in numbers over the years. 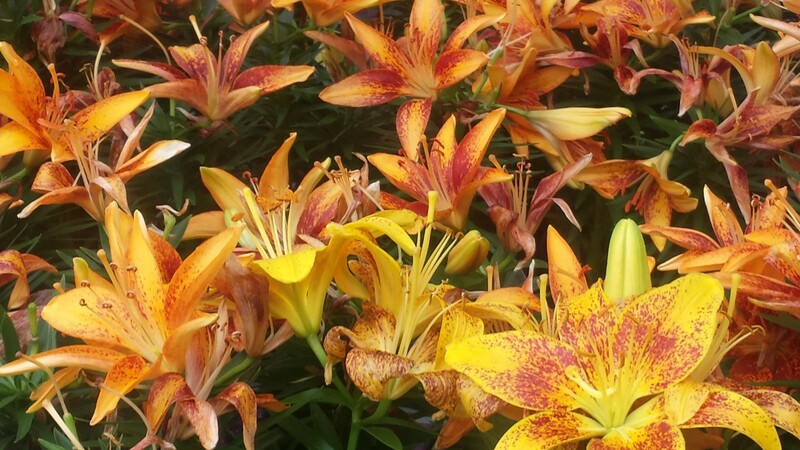 Your yard must be gorgeous when they are all in bloom. Thanks for your comment. We have a few iris patches in our home here in WV. Such a beautiful hub you have done Peggy, which is expected. I really love your work. The dedication presents itself on the page. Great pictures and great article. up and beautiful! Good day. What a nice thing to have those irises and tiger lilies from your friends...and now the memory of the one who is deceased as well as of her husband every time you look at them. Perennial flowers which easily spread and multiply are such great gifts to be shared with friends. Thanks for your nice comment and votes. Awesome hub with stunning photos! 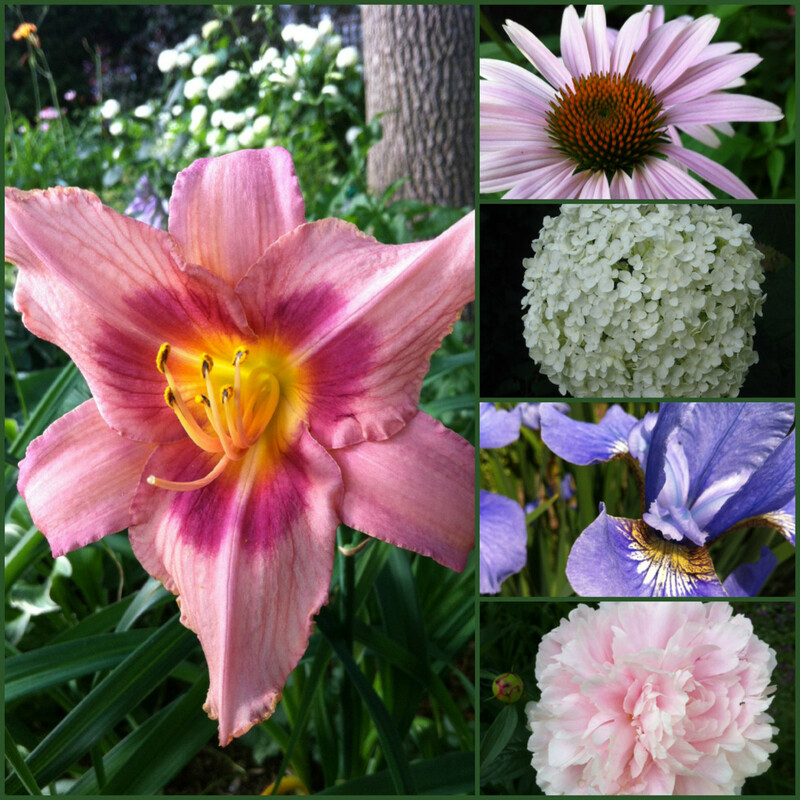 I never knew there was such a variety of iris plants and so many different colored flowers. When we moved from New York to Delaware, our close friends gave us iris and tiger lilies for our new home and now, almost 10 years later, one of those dear friends is deceased, yet the flowers are a lovely reminder of her own great beauty and spirit and that we are still blessed to maintain a close relationship with her husband. Never thought to bring the iris stalks inside and display them in a vase. Will do so this year. Thanks for sharing this informative and beautiful hub. I'm rating it up, useful, awesome and beautiful. Oh yes...we badly need rain here in and around Houston, Texas. Our sprinkler system is certainly getting a workout these days. Glad that you enjoyed the time lapse photography of the irises opening in that YouTube video. It is fun to see. Thanks for the comment. These are pretty colored Louisiana irises. The nice thing about irises is that they come in so many different colors. Had some fun taking these pictures. I even liked the slightly blurred ones. Makes them look a bit impressionistic. Glad that you liked the pictures and thanks for your comment. Beautiful hub. I love time lapse photography. I'm sure you are together with me wishing we would get some rain - for all the flowers and plants. What a nice blending of plants...the irises and daylilies! I had masses of both planted in various gardens we have had over the years. 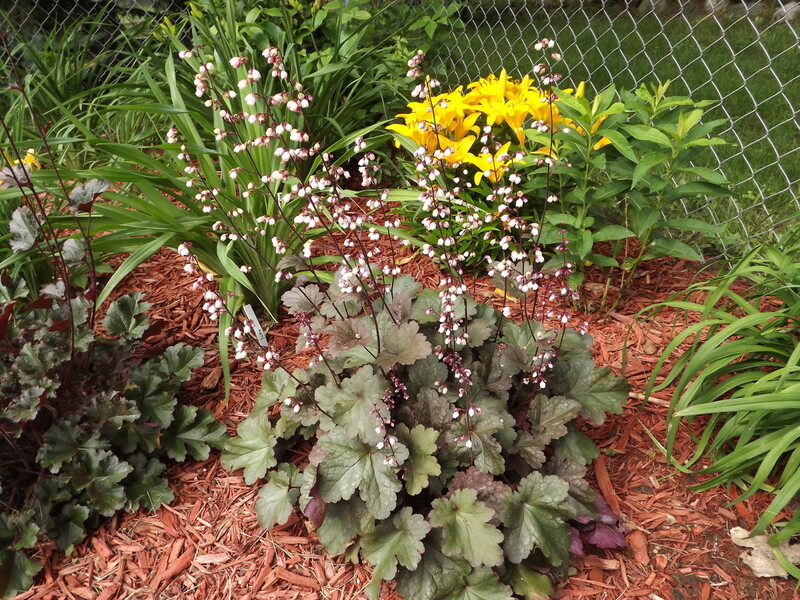 Both of them are great flowering plants to get started as they are both easy care and spread. Enjoy your garden in N.C. and thanks for your comment. Happy to hear that you liked this hub about growing irises. I had some fun taking the various pictures of the cut Louisiana irises that were given to me as a gift. They are still blooming one week later as the second buds on all of the stalks are now open and a few of the third buds will soon be opening. They make for a long lasting (and much appreciated!) gift. Thanks for your comment. Beautiful purple and blue hues with these Louisiana Irises Peggy. Ours just finished blooming here in N.C. Day lilies are opening now. Irises were one of my father's favorite flowers. The Louisiana Irises do quite well in Houston so give them a try in Florida. If they grow as well there as they do here, you will soon be sharing them with others. Good luck and thanks for your comment. Irises are so lovely, and your photos really do them justice. I always know that spring is here when I see the purple, yellow and white Irises blooming beneath the trees out in front. I'm happy to learn that these beauties can be divded. So thrilled that I came across your hub, Peggy. Voted up, useful, awesome and beautiful. And you ~ are the loveliest flower of all! I have always adored Iris flowers. They are so delicate looking in their beautiful colors. I didn't think I could grow them in N. FL, but if you can grow them in Houston I think I will try them. Beautiful hub. Glad that you enjoyed this hub about Irises and especially if it inspired you to grow some of your own. Irises are truly beautiful flowers. Thanks for your comment. So you are either from Louisiana, Michigan or Tennessee! With the orange color, I am making an educated guess that it is Louisiana. Right? Enjoy your state flower...the iris. Do you grow them as well? Thanks for dropping by and leaving a comment. Enjoy your iris! They are nice plants to have in the garden. How many varieties do you have? Thanks for the comment and vote up. Ah...but don't you like to look at pretty scenery? I love the beauty and the scent of fragrant flowers, trees and shrubs. Thanks for commenting on this Iris hub. Wow...a very infomatve and helpful hub. Iris are beautiful flowers and I might just give them a try. Thanks for sharing your knowledge. So glad to learn more about these amazing plants. My iris are in need of attention and I would like to expand the varieties. I'm still waiting on a Russian iris to bloom this year. Some friends of mine are quite interested in flowers. I am usually amazed when they get together to see the enthusiasm. For whatever reason I have never had the urge to grow anything that I can't eat in a garden.